The Roadmaster Booking in partnership with MS Metal Press is pleased to announce the dates of the european tour of the brazilian Brutal Death Metal band IN TORMENT. 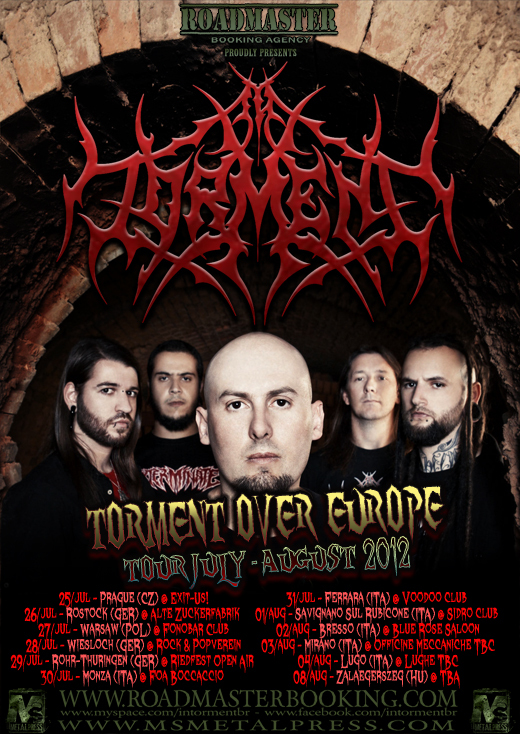 Titled “Torment Over Europe 2012”, the tour aims to promote the second album “Paradoxical Visions of Emptiness”, and will pass through Czech Republic, Germany, Poland, Italy and Hungary. During the tour the band will perform alongside big names such as SUFFOCATION, ORIGIN, and DRI, and will be one of the headliners of the traditional German festival Riedfest Underground Metal Open Air along with SINISTER, DEMONICAL, among others. “We are indeed very excited to be able to celebrate our 15th year of existence with an overseas tour. Take with us the banner of Brazilian Death Metal, sure that this is just the beginning of a very serious work, and that will enable us to other experiences like this, “said the singer Alex Zuchi.